I am still indulging in this hobby after all this while! Nothing much have changed, but most postings and activities have shifted to Facebook groups. It is getting progressively harder to find new bird species, but there is no real timeline to achieve any goals these days. I have settled on a routine of visiting certain places regularly with my camera. Mostly I get to see more common species. On bad days, I just get rained out. On very good days, I get the thrill of seeing something new and get reminded why I still lug my heavy equipment to the field. 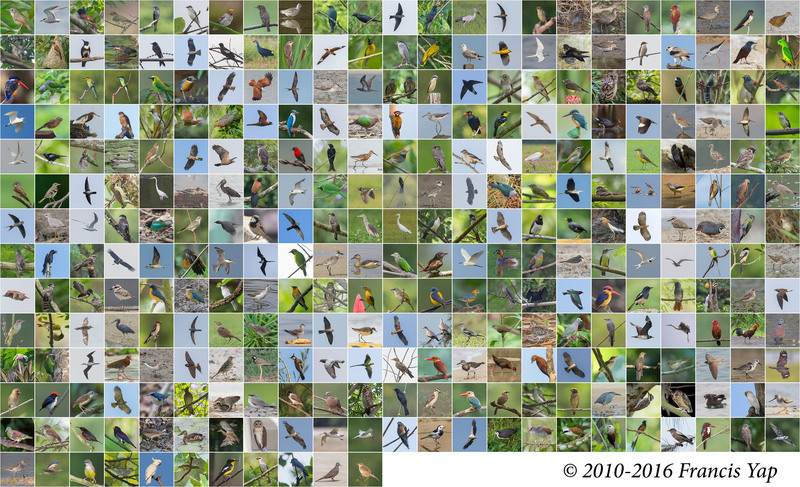 So here’s a collage of all the wild bird species I have seen so far in Singapore since I started 8 and a half years ago. 331 species seen and photographed. Not a milestone, just a snapshot of my birding progress. Seen from afar, the collage is mostly small birds with blue sky and sea, green foliage and earthy tones. Just the way I like them! This entry was posted in Birds, Wildlife on November 15, 2018 by Francis Yap. It’s been almost nine years since I was diagnosed with keratoconus, a degenerative eye condition that result in blurred vision and acute astigmatism. Both my eyes are affected, with my left eye having a severe case that cannot be corrected by eyeglasses. That left me with my right eye (with a milder form that is correctable to a greater degree) to take care of all this vision thing that almost everyone else take for granted. A recent check in November with an eye specialist revealed no substantial worsening or improvement on the condition. What prompted the visit was however more interesting, as I had a lump growing rapidly at the corner of my left eye. That resulted in a visit to the hospital and hence the check with eye specialists, and subsequently a day surgery. After the removal of the lump, histopathology test revealed that I have another condition called Kimura’s disease, a rare but benign chronic inflammatory disorder. There are still remnants of the lump after surgery but for now, the proliferation of the cells have abated. I should be thankful that things are what they are, and I can continue to go about my life somewhat normally. Not having good eyesight certainly have not stopped me from indulging in birding as a hobby, but getting a health scare does make one evaluate things a bit. 2016 was a relatively relaxed year for birding, similar to what it was in 2015. I’ve settled on routine weekly walkabouts at my regular birding spots, a few overseas jaunt, and the occasional scrambling when a local bird rarity appears. Since my last post a few months back, I’ve photographed a couple of new birds. The count is now 318 bird species photographed in Singapore. I reckon if I keep at this pace, 330 birds should not be a problem in the next few years. The goal now have shifted to getting better photographs of existing birds. Last year, together with some birding friends, we started a community project to better document the bird species found in Singapore. The Singapore Bird Project website was launched with write-ups and photos of birds from a bunch of top bird photographers in Singapore. This informal group also went on to organize a few pelagic trips, resulting in the addition of a new bird species for the Singapore checklist, the Bulwer’s Petrel. The website itself is growing stronger with increased monthly readership over time. Another new initiative in 2016 was to set up a new Facebook Group, Wildlife of MacRitchie & Central Catchment to showcase and raise awareness of the diversity of wildlife at MacRitchie and the Central Catchment Nature Reserve in Singapore. To complement my existing personal Facebook Page, I have also set up an Instagram account to post photos of birds I have seen along the way. So all in all, it has been a very busy and productive year despite the special Ks getting in the way. Let me end by posting a few photos taken in 2016. Here’s hoping 2017 will be an even more eventful year! This entry was posted in Birds, Milestones, Nature, Wildlife on January 21, 2017 by Francis Yap. The blog is still pretty much dormant since the last time I wrote. I’m still birding but more and more, the pictures and stories are shared in Facebook or Instagram. There are still stories to be told, birds behaviour to note down in longer format, and in more details, but I’ll leave that for another day. I’ve just completed my 6th year of birding today. Travelled overseas a bit more this year and saw a few more local birds. Pretty happy with the hobby and hope I can continue further. 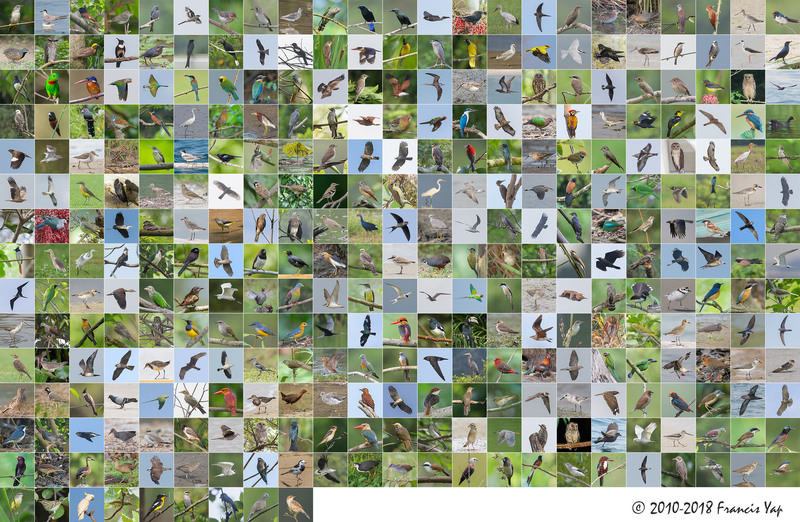 Below is a collage of all the bird species I have photographed locally in Singapore so far. All 310 species of them. All taken in tiny Singapore. Larger photos with description at my Google Photo album. Singapore birds shot between April 2010 to April 2016. This entry was posted in Birds, Milestones, Wildlife on April 28, 2016 by Francis Yap. When I first purchased a telephoto lens and camera in April 2010, the main goal was to have a walk around set up in the neighbourhood and documenting the wildlife that inhabit it. Soon my focus turned specifically to birds. Years ago, when I bought a DSLR to photograph my growing child, I had started learning about photographic techniques in a local photographic forum. I must have browsed through many photos in the forum looking for inspiration. Among them were truly well taken photos of birds from a small group of local wildlife photographers that travelled around the entire island looking for our feathered friends. I wished then that I had that luxury of time to pursue such a hobby. Once I started focussing on birds myself, it was not long before I started doing the same chase. Neighbourhood walks turned to long car drives and then long treks. A handful of birds turned into 50 and then 100 birds within a few months. Months soon turned to years and my photo collection grew. Five and a half years later, I have photographed 303 wild bird species. That’s not a big number. In Peru, a team of committed and well prepared birders saw a total of 354 species in a day! Nonetheless, I am pleased to break the 300 species mark in Singapore itself. There is no big celebration or announcement. I have participated in two Big Year competition against other birders in 2012 and in 2014, but this one was different. It’s a quiet personal journey with no definite time frame. I hope to and will work on seeing more birds in the future, one new species at a time. If you are interested in the bird species I have photographed, the latest photos (one photo per species) arranged alphabetically is posted in my Google Photo album. The ones posted below are randomly placed. This entry was posted in Birds, Milestones, Wildlife on November 11, 2015 by Francis Yap. The Red-crowned Crane (Grus japonensis) is an endangered crane species that is found in northern Asia. One of the places where it can be more easily seen is in Hokkaido, Japan where they are a resident species, unlike the migratory ones elsewhere. In Japan, they are called tanchōzuru or shortened tanchō (red-head). They are considered sacred and seen as a symbol of fidelity, love and longevity. But they were on the brink of extinction due to hunting, mainly for their plumage. Although hunting them is a thing of the past and conservation work is ongoing, currently there are only around 2,750 birds left in the wild, including about 1,000 birds in Hokkaido. In fact in 1926, there were only about 20 birds left in Hokkaido, but urgent conservation work increased their numbers substantially. One of the measures they did was to set up feeding grounds for the cranes during wintertime. At the end of 2014, I brought my family to Hokkaido for a vacation. It was not a birding trip, but since my wife arranged for one where we had an opportunity to see the Red-crowned Cranes feeding, I brought along my long lens for the trip. Arriving on a cold and snowy day, I was delighted to see so many of these cranes at the feeding site next to Akan International Crane Centre at Kushiro. Although snowing and frankly having too long a lens, I managed to take some photos of the cranes and even a sequence of their famous courtship ritual. They are now considered ‘one’. This would have been a great shot, if only there were no other cranes in the frame. But it is a busy feeding lot and I did not have time for a re-do. Coming apart. This was not the end of their courtship ritual, but the couple continued on. But it was hard to pick them apart in heavy snow and with the lack of contrast, so I lost track soon after. As most of the tour group were not nature lovers, and coupled with the fact that it was cold and snowing heavily, we spent less than an hour at that place. I so dearly wished we had more time to see these enchanting cranes. Perhaps a return journey one day to see them, the Stellar Sea Eagles and Blakiston’s Fish Owls. This entry was posted in Travel, Wildlife and tagged Red-crowned Crane, tancho on May 8, 2015 by Francis Yap. I had been eagerly following the news of the Smooth-coated Otter family from Bishan for some time, but did not have the opportunity to see them in person sooner due to other commitments. To recap, there is now a family of Smooth-coated Otters that has made their home at Bishan Park. To understand the circumstances of how they came about and to enjoy really great commentary and pictures about them, please head to these two Exposure stories and pictorial by Shirley Ng (LINK) and Jeff Tan (LINK). They have been following these otters and documenting them from the very beginning. To ensure sane load time, I have separated the article and the rest of the photos. Please click on the respective photos in the photo gallery for more commentary. The otters are looking curiously at some people at the palm grove on the right, trying to get a closer peep. A pile of otters. The young otters are nursing. Papa is on the left and Mama is on the right. It was drizzling and slightly windy evening, with the weeping willow tree gently swaying to the breeze. Half sleeping otters cuddling. The backdrop of a pond reflecting the greenery nearby. What’s there not to like? It is the ‘hands’ that do it for me. Unlike other four legged animals, otters seem to grasp things almost human-like and when they put their paws on each other, they seem like comforting one another. But I am no otter expert, so just a conjecture. Despite Papa otter showing of fangs, the otters are not aggressive at all. They are actually a calm family as long as you keep your distance. If you get too near they scramble. They are checking out the crowd that were gathering near the photographers. Papa otter going about his pooping business. Whatever papa does, so can the little one. This picture is cropped a bit closer, so the baby otter is actually smaller. Every otter is looking at a different direction for their parents. At this stage, they can swim well enough, but are dependent on their parent for food, as they still have not learned the finer art of catching fish yet. The 3 little otters, after all their houses have been blown down by the big bad wolf (OK I made that up). They are actually at the little island safe from any human. Two little otters and their parent after a swim. Looking warily at the growing crowd. Sometimes, photos alone don’t do enough justice in conveying animal behaviour. That’s when videos come in handy. Hope you enjoy the snippets obtained. These were prepared in full HD format. I have embedded them in the article, but click on the title of the video to launch it in full resolution at YouTube to have a better experience. 1. The otter family preparing their resting place by smearing and rolling on the grass and soft earth that was wet due to the slight drizzle. They were having a rollicking good time as well. As this stage I was positioned rather far despite my long lens system as I was unsure about their temperament. 2. I found a better position to observe their frolicking and the subsequent nursing of the young otters. You can see how wary the parents were by their constant checking of their surrounding. Out of the camera view, a middle-aged man got very near to take photos presumably using his camera phone. I tried in vain to beckon him to move further earlier and you can see him at the 3:44 mark and the subsequent reaction of the family. 3. Having decided that we were of no threat, Shirley, Jeff and I inched closer. I had the longest lens, so I was good for a full frame video. 4. I think this is about the best video of the lot. Loving family with a beautiful backdrop, with the sound of the urban surroundings. 5. Bonus video. It started raining and the otters had to leave and the photographers had to temporarily scramble. It’s a wrap then! Lastly, it looks like the otters are making a comeback in Singapore over the past few years. There are now otter families regularly sighted at Gardens by the Bay, Sungei Buloh, Lorong Halus and Pasir Ris Park. I have seen grownups squeal in delight seeing them for the first time. There is much to be said about our local charismatic megafauna and its effect on us. If we do want them to stay around, at the minimum please let them have their personal space and tolerate the things that they do. They are not pets, cuddly as they may seem. Wildlife deserve a place in Singapore, and we should do our part to conserve whatever is left. The tigers are long gone, but at least we should keep our otters. This entry was posted in Mammals, Wildlife and tagged bishan park, Smooth-coated Otter on May 6, 2015 by Francis Yap.